Are you struggling to keep on top of all the things you have to do? If you are like most people, you have discovered there are more things to do than time available to do them. Not only on a day to day basis but also week to week, month to month and year to year. The reality is you will always have far more to do than time available to do it. We have our regular work to do — reply to client emails, write the report, prepare and deliver the presentation, prepare the designs for the autumn/winter collection etc. And then we have our regular personal errands to do — grocery shopping, cleaning the house, planning our Summer holiday and spending time with our friends. It never stops and it can feel overwhelming. With all this stuff to do, if we do take some time out and try and get some rest we feel guilty and unproductive and begin to wish we were “more productive” or better at “managing our time”. This is just a fact of life. We do have far more to do than time available to do it and the way to get all this stuff under control is to accept that your time is limited and become more selective about what you spend your time doing. Each day, you get twenty-four hours — or 1,440 minutes. That’s the same for everyone. What you do with that time is up to you. If you decided to contract with a company to spend eight of those hours, Monday to Friday doing work for them, then for eight of those twenty-four hours you do the work assigned to you by that company. If you use some of those eight hours to chat with your coworkers about your weekend, order a new jacket online and chat with your friends through instant messaging, you are not doing the work assigned to you by the company. You will naturally find you don’t have enough time to complete the work assigned to you in those eight hours and as you ‘borrowed’ time from the company to do personal things, it means you will need to pay back that time from your personal time. All of these ‘extracurricular’ activities add up leaving us feeling rushed, overworked and overwhelmed. One of the best ways to get things under control and to feel less overwhelmed and stressed about the work you have to do is to write down everything you have to do. This externalises the things you have to do and when you see those tasks written down you will immediately feel a sense of relief. Our brain is terrible at storing things to do because it keeps reminding us to do them at the most inappropriate time. You could be out on a date night with your partner, enjoying a gorgeous sunset with a nice glass of wine and your brain reminds you of the presentation you have to do on Monday. Or you could be in the middle of a job interview and your brain reminds you to make a dentist’s appointment. Your brain just does not understand the context. All it knows is you need to remember something and it will remind you whenever it has that thought. When you start collecting all your ideas, tasks and events into a trusted place — a to-do list manager, notes app or notebook — your brain relaxes. It stops reminding you to do things at the wrong time and it starts to work for you by being creative. This transition does not happen immediately, but as you develop the habit of collecting stuff, you begin to trust your ‘system’ and your brain relaxes. It’s a simple change that will give you huge results. The very act of writing down what you have to do in a clear, concise way relieves your brain from having to remember to do something. When your brain no longer has to remember everything it quietens down. It now has space to develop ideas, solve problems, be creative and be present to enjoy the scenery, the people you are with and the environment. You no longer feel overwhelmed because everything you have to do is written down in a place you trust. When you begin organising your list of to-dos and ideas and making decisions about when you will do them your feeling of overwhelm and stress will begin to reduce. Part of the reason we feel stressed and overwhelmed is that long list of things we have to do has not been evaluated and assigned a time to be done. This is where the power of your calendar comes in. You don’t have to micro-manage your calendar, you just need to assign periods of time to do the things you need to do. Saturday afternoon between 1 pm and 3 pm could be assigned for cleaning your house. Friday night could be assigned for meeting up with your friends. Monday morning between 8:30 am and 10:00 am could be assigned for working on your presentation. You get to choose. When you bring the power of collecting, organising and doing together into a fluid system, amazing things begin to happen to your wellbeing and overall feeling of control. Your stress is really caused by the feeling of being out of control not the long list of things to do. We all have a long list of things to do. The problem is you have no idea exactly what needs to be done and how you will find the time to do it. When you do get those elements under control by collecting all your commitments and to-dos into a trusted system, organising those commitments and to-dos in a way that gives you the time to complete them you soon feel more relaxed and in control. Your decision making becomes easier because you know exactly what you have to do and when you will do it and almost all areas of your life improve. You are more relaxed, more engaged and more disciplined and because these areas of your life improve so do your relationships because you are much more connected in the moment and not worrying about what you have to do and how you are going to find the time to do it. This is a simple change, but one with huge benefits. It does not take long to develop the habit of collecting everything into a trusted place, and spending a few minutes at the end of the day organising what you collected so you assign time to do them. When you start doing this you brain is released from the burden of trying to remember everything and when that happens it starts to work with you instead of against you. If you have never tried this before, I have a FREE online course you may wish to take that will give you the know-how and skills to create a system that works for you so you can start to get control of your life and unburden your brain and feel a lot less stressed and overwhelmed. How Your Reasons For Doing Determines Your Level Of Happiness. Your happiness comes from your reasons for doing whatever it is you are doing. It’s your reasons for doing it that ultimately leads to you feeling happy, satisfied and fulfilled. When we get our first job, most people do it for the money. We fall into the trap of get a well-paying job, buy a nice house, buy a nice car, go on nice holidays etc. It’s all about the money and what money can buy us. At some point, though, we discover having that nice house, car and those increasingly expensive holidays no longer give us the buzz they once did. So we buy more and more expensive luxuries and the thrill we feel having those new things lasts less and less. So what really is the secret to feeling happiness, joy and fulfilment? It’s your purpose — your reasons for doing whatever it is you are doing. When you do something for someone else and you see the smile and gratitude on their face, the feeling of happiness stays with us all day. When you give a friend a piece of advice and they act on it and it enriches their lives, the feeling we have, knowing we helped them — even in a small way — is lasting. If we are doing a job for the money, we soon begin to hate the job. We resent having to go to the office every day. Our commute becomes a drudge and we spend most of our time complaining about email, our boss and colleagues. But if you are going into work because you are doing a job that enables people to look their best by designing great clothes for them or you design beautiful buildings that give people a comfortable and safe place to live. That’s a purpose worth going through traffic hell for every morning. It’s your mindset for doing the work that brings you joy. Not the paycheque at the end of the month. Too often the deciding factor for taking a job is the salary. Yet, that will never bring you fulfilment, joy and happiness. Whether you do a great job or an average job you still get the same amount of money each month. But if you took a job because of what that job will enable you to do to help people live better lives, now if you do a great job your sense of fulfilment and happiness increase massively. Improving the way you work would mean more people benefit from your efforts. That’s an incentive worth getting out of bed for. Of course, we need a certain amount of money to survive, we need to eat, to have shelter and we need to be able to move around. But a lot of what we use money for we don’t need. We just think we need because everyone else has it. I would certainly not say that money is not important. It is when it becomes your purpose. When it becomes your purpose you will never have enough. And the more money you receive, the pleasure it brings diminishes. Yet when your purpose is about giving and helping others, the joy you feel increases. How this affects your productivity. When you look at your projects list, what are the reasons you are doing those projects? Do you have a clear purpose for doing them? When you go to the gym what are your reasons for doing so? Why are you trying to achieve your goals? When you have a clear, higher purpose for doing everything you do, you will find your energy and passion increase. The closer that reason is to helping other people or making the world that little bit better, your sense of fulfilment will improve and so will your enthusiasm for doing the tasks or completing the projects. This really is a simple mental shift. Rather than focusing on the material benefits to you, focus on the benefits you will give to others. Going to the gym means you are keeping yourself strong and healthy so you can be there for your family. Doing the accounts for the small business that needs your help so they can thrive and support the community by providing jobs and a service people want. Whenever I sit down to write a blog post, record a YouTube video or podcast, in my mind I see the people I am trying to help. I have a clear vision of the difficulties they are facing and how I might be able to help them with some advice, or a new way of doing something. That’s all the motivation I need to write, record or prepare. Knowing that somewhere, maybe, I have helped someone become less stressed and be able to spend more time with the people they care about. Every piece of work you do has a higher purpose than money or personal material benefit. It is when you focus on those higher reasons you will discover long-lasting happiness and joy and a passion and drive for what you do. How Becoming More Productive Improves Critical Soft Skills. To get ahead in your career it is not enough to have the right degrees from the right universities. 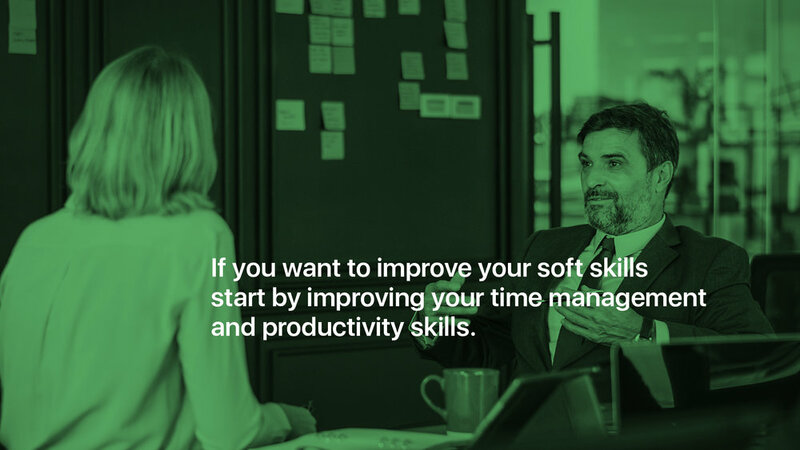 Today, to make sure your career moves in the right direction, you need to develop a number of critical skills that collectively are known as “soft skills”. Soft skills are skills that are developed through practical experience. Communication, decision making, negotiation and conflict resolution, for example. Skills that cannot be taught from a textbook or in a lecture hall. These skills can only be developed by practice. School and university curriculums are, for the large part, built around the tired old tell teach method where a teacher or lecturer stands at the front of the classroom or lecture hall and tells students what to learn. Not a very useful way to prepare students for the realities of the modern world. School and university do not prepare you for life, they prepare you to pass exams. The development of soft skills — skills that are essential for life — are left to outside influences. Your friends and parents. Life experiences and the skills you get from reading the right books and applying what you learn to everyday life. Most people’s relationship with email is bad. Email is considered annoying, stressful and overwhelming. Yet, it is the primary form of communication in business and being slow to respond to a colleague or customer ‘s email causes delays in projects and important decisions as well as frustration from the people that are waiting for you to reply. When you become better at managing your time you become better and faster at responding to your emails. You are in control of your inbox and know what’s in there, what needs responding to, reading and deleting and you have time to respond in a timely manner to all important emails. If you practice a system such as my COD system or David Allen’s Getting Things Done you learn to make decisions quickly. You ask the right questions about what something is: “What is it?” Is it relevant to me? What’s the next action? Etc. With practice, you develop decision-making skills that can impact your whole life. You might be wondering how being better at time management and productivity can help with conflict management but it does. It does so because when you are better at managing your time you are able to give people better attention. You are not just physically present, you are also mentally present. Being present and giving another person your full, undivided attention means you are able to listen and understand their perspective and are able to make better and fairer decisions about what to do to resolve issues before they become conflicts. When you are in control of all that is coming your way and have a system in place that allows you to compartmentalise your work, you become much better at managing people and their issues. This may be an obvious one. When you are in control of your time and have your work and commitments prioritised and organised you will experience a lot less stress. Stress in the workplace is generally caused by over-committing to work and increased workloads that pile up. Not knowing what needs doing and by when leads to panic setting in and this causes stress. When you write everything down and have everything organised in its rightful place you feel in control. You know what needs doing and by when and you do not feel overwhelmed. Having a time management and productivity system in place means you can handle any changes that come your way with ease. All projects change over time. Outcomes change, timelines change and so do the people involved in the project. When you have all your next actions organised in a list you can change them, adjust timelines and adapt. When you don’t have a system in place any changes to a project you are working creates uncertainty, a lack of clarity on what needs to happen next and a lot of confusion. Being a productive person allows you to accept changes and adapt accordingly. When you are in control and you know what the outcome is you are leading. Too often, we are doing work each day that has no clearly defined goals or outcomes and we just keep out heads down, do the work and not worry about which direction we are going in. Organised productive people know the outcomes of all their projects with clarity. They know what the outcome needs to be and they lead their teams forward knowing they are going in the right direction. With that clarity of purpose comes clear communication which ensures all team members are moving in the right direction with purpose. So, If you want to improve your overall soft skills, start by improving your time management and productivity skills. That one skill will lead to improvements in all other soft skills and allow you to build a career of success and fulfilment. Busyness is not a physical state it’s an emotional state. Everyone has a lot of things to do each day and that list will never end. Every day we have to make breakfast, make our beds, brush our teeth, prepare our kids for school and choose the clothes we will wear for the day and then go and do a day’s work. Millions of people around the world have the same or similar routine every day seven days a week. Yet some people say they are busy while others have everything under control and feel calm and relaxed. Why? In this week’s article, I give you five reasons why you feel busy and five ways to fix them. This is the number one reason so many people feel busy. Not writing down what you have to do means you are relying on your brain to manage the things you have to do. Our brains are terrible at being a to-do list manager. Our brain does not compartmentalise what needs doing. So it reminds you to reply to an email while you are brushing your teeth just before going to bed. It reminds you to wash your daughter’s sports kit while you are in the middle of an important presentation. Your brain is just not designed to be a to-do list manager. Get yourself a simple ring-binder notebook and carry it with you everywhere. Whenever you think of something that needs doing write it down. Alternatively, if you prefer a digital notebook or list manager, then get yourself an app. There are thousands of them in your App Store. 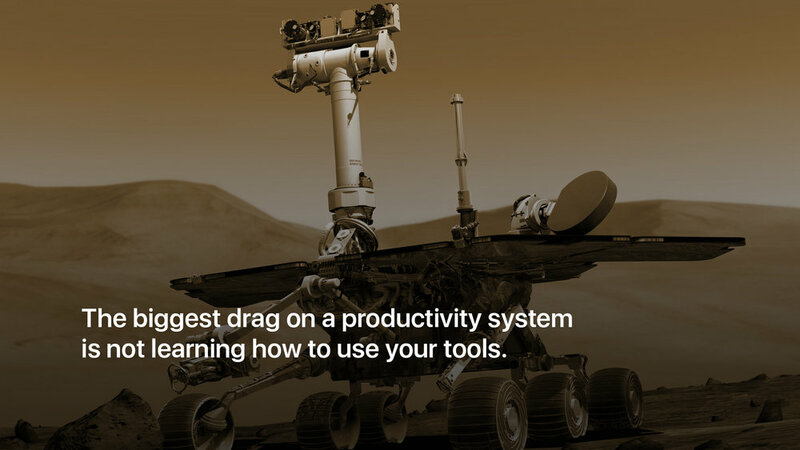 It doesn’t have to be a complex app with a steep learning curve. You just need a trusted place to collect everything you have to do. 2 Your ‘system’ is too complicated. Another common mistake. An effective to-do list is simple. It does not have a complex hierarchy of projects and sub-projects. It is just a list of the projects you have on at the moment with the tasks you have to do to complete those projects nested nicely and simply inside those projects. I often get questions about dependent tasks, tasks that should recur every 3.5 days and tasks that may or may not be a task because the way it has been written is not very clear. Stop! A to-do list does not need all that complexity. All you need to know is what should be done today. That’s all you need to see. You do not need to be messing around with complex organisation structures. It’s just a list of things to do. Your calendar never lies. 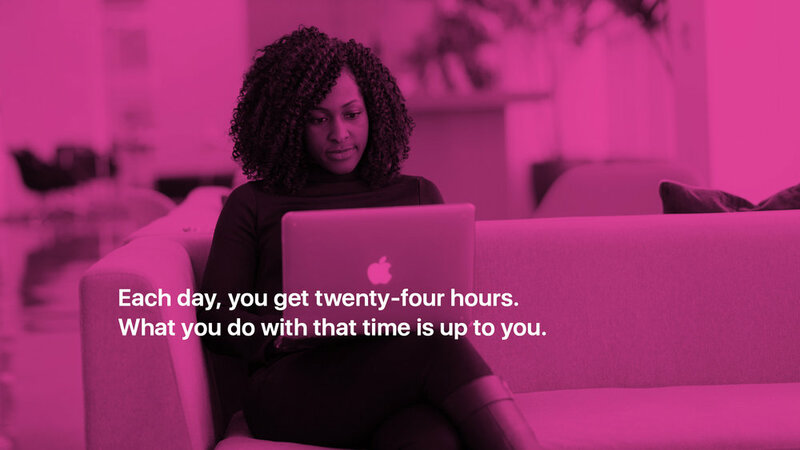 It has 24 hours each day and you get to choose what you do with those 24 hours. Most people delegate responsibility for their time at work to their colleagues by allowing them to schedule meetings on their calendar. If you want to get control of your time start blocking time out each day on your calendar so you can get on with the important work in your life instead of being at the beck and call of your colleagues who love nothing more than to have another meeting to discuss a problem they are incapable of taking responsibility for. Do you have four hours in the evening? Then schedule an hour or two for self-development every evening instead of watching pointless TV shows that are doing nothing for you except making you fat and lazy. Read a book, go out for an evening stroll or learn something on YouTube. With your calendar, anything you decide to put on there gets done. No excuses. It gets done. This is to golden rule of any calendar. This is your time. Sure you may have contracted out eight hours of your day to the company you work for, but that still leaves you eight hours for sleep and eight hours for whatever you want to do. Use that time constructively. Don’t waste it. Here’s an interesting thought. For every “yes” you say to a commitment or event, you are saying “no” to doing something else with that time. If you fill your days with other people’s work and requests how much time do you have left for what you want to do? People often see any free time on their calendar as time to fill. But that’s not true. If you have free time on your calendar, schedule that time for your family, or taking a gentle walk in the park. You don’t have to fill every available time on your calendar. Part of the reason people feel overwhelmed and busy is they are not allowing any time for themselves and that’s because they can’t say “no”. Every day you need at least one hour for quiet time. To read, to do your hobby or to get some exercise. This is your time and you should never ever give it up for anyone else. Learning to say “no” gives you complete control over your time. When you have control over your time you feel less stressed and less overwhelmed and busy. If you are not planning the day, you are giving responsibility to someone else to plan your day. Whether you like it or not, every day you live is planned. Either it is planned by you, your company, your partner your school or your clients and customers. Every day is planned. In my experience, the people who feel less busy are the ones who plan their own day and do not leave it to fate to plan it for them. And planning your day does not mean spending hours thinking about what you want to do. Planning your day should only take around ten to fifteen minutes and the best time to plan your day is the evening before. When you take ten to fifteen minutes to look at your calendar for the next day, review the tasks you have scheduled for the day and add or subtract tasks where necessary, you sleep better and you start the day with the things that you want to get done. When you plan in the morning — when you arrive at work — you waste time and energy deciding what to do. You will get a lot more done and feel a lot less busy when you start the day knowing exactly what it is you want to get done. So there you go, five reasons why you feel busy and five fixes so you no longer need to feel busy. We all have enough time to get the important things in our life done. We do not have to spend every day feeling busy and overwhelmed. When you stop and write everything that needs doing down, keep your system simple and have a plan for the day, you will feel more relaxed and in control, have more energy and find that all the work that used to make you feel busy just gets done when it needs to get done. A couple of weeks ago, my wife and I went on a family trip. It was only a three-day trip, but before going I needed to do some backend work. What do I mean by backend work? The backend work is going through your calendar and to-do list manager and looking to see what is coming up over the next week. It also means looking at what work you would normally do on the days you will be away and scheduling time to do the work before you go. The worst thing you can do is put it off until you return. When you return you will have the work you didn’t do as well as all the additional work that mounted up while you were away — not a good way to restart your work when you return. Because trips like this are planned, I knew it was coming up and because I am always looking ahead to see what is coming up and seeing where I can relieve any potential pressure and bottlenecks before they occur, I was able to schedule my YouTube video recordings, podcast recording and editing and write the following week’s blog post before I went away on the trip. It sounds like a lot of work to do, but when you have the backend processes in place, it is a lot easier than it sounds. Yes, there is an increased volume of work for a few days, but when you make full use of your calendar and to-do list manager, it is a lot easier than you think. The alternative is to not plan ahead and have my family break ruined by worrying about when I will have time to catch up with my work. To me, that is not an option. I would much rather have an intense few days before my break, followed by a fully engaged, worry-free time with my family. That’s a managed interruption to a normal working routine, what about unplanned interruptions? A crisis at work, a loved one becoming seriously ill or your car breaking down on the way to work? This is where having the processes in place to handle these crises comes in. I often tell my coaching clients to stress test their systems once they have them up and running. It’s fine for a system to work when you are doing your normal day to day work — when things are running smoothly — the real test is how well your system works when things go crazy. And things going crazy is a guaranteed part of life. For example, When you do the weekly review, you can look ahead and see what your schedule looks like for the week ahead. 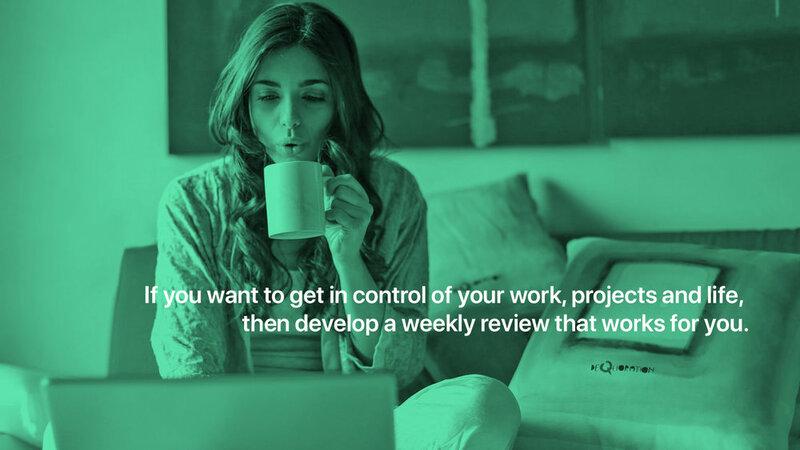 You can review all your projects and identify work that needs doing next week and schedule time for doing that work. You can also build in flexible time to handle crises and any work you have not managed to get done or finished. This week, for example, I have an article to write for Lifehack. The deadline for that is Tuesday evening. I don’t have articles to write for Lifehack every week so it is additional work. Whenever I get work like this, I look on my calendar for 3 hours. I know I need two hours to write the draft and a further hour to edit. So, I scheduled 2 hours for writing the article Monday afternoon and will edit the article on Tuesday afternoon. The backend work is knowing how long an article will take to write and scheduling that time on my calendar. The writing of the first draft will be an objective for Monday so if the day goes crazy, I know it will get done — my objectives always get done. That’s the power of the 2+8 Prioritisation system. Each day have two objective tasks and eight focus tasks to complete. Having the backend work done, knowing what you have to do and by when, scheduling the appropriate amount of time on your calendar to get it done and then doing it, that’s making sure you have the backend work done. So while you might think taking time out of your already busy schedule to plan and have in place a system to make sure the work gets done is time you do not have, the alternative — not having a plan or a system — is what is causing you to feel too busy, overwhelmed and stressed. If you want to end that perpetual feeling of being too busy, you should stop, sit down and gather together everything you have to do and make a schedule to get it done. Put in place a system that prevents interruptions — blocking your calendar, turning off notifications on your phone for an hour or so and listening to some soothing music — you don’t have to disappear completely, just for an hour or two each day. Don’t worry, your boss, customers and colleagues can wait. 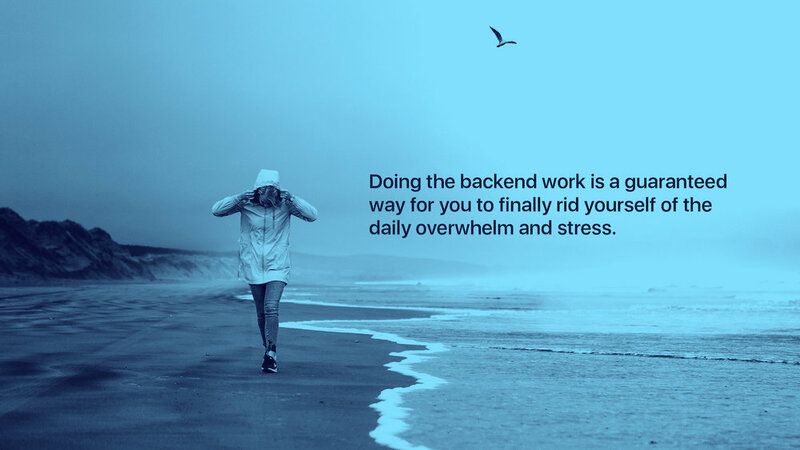 The backend work — putting in place the planning and system — is a guaranteed way for you to finally rid yourself of the daily overwhelm and stress. It is your key to having the freedom to do the things you want to do when you want to do them. Thank you for reading my stories! 😊 If you enjoyed this article, hit the like button below 👍 It would mean a lot to me and it helps other people see the story.